Scout Jumuah is the primary date to recognize the contributions of young people and adults to Scouting within the Muslim Community. 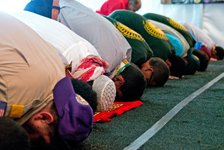 Masajid and other Islamic institutions that charter Scouts or who have Muslims in Scouting, should use this day to celebrate and highlight their achievements as well as highlight the need of working with the youth in the Muslim community. The National Association of Muslim Americans on Scouting (NAMAS) designated Friday, February 9, 2018 to be Scout Jumuah. Some units may adjust this date in their locale to best meet their needs. For more information on the inaugural Scout Jumuah please see the National Association of Muslim Americans on Scouting (NAMAS) website. Scout Sunday is a great opporunity to share Scouting with your community, check out the bulletin insert available for customization and place your order today! As Scouts, we constantly experience the joy and beauty provided to us by our God. From the natural symphonies that carry us to sleep on a campout, to the majestic sunrise that crests over the mountains, we are in awe of our maker. It is no wonder that Scouts pledge to be reverent as part of the Scout Law. Please join us for the Duty to God Encampment in the fall of 2018, a weekend full of fun, service, and worship. Bring your Cub Scouts, Boy Scouts, and Venturers to get started earning their religious emblem and take part in a Messengers of Peace service project. You will have opportunities to worship with other Scouts in your individual faith group, and also take part in the Faith Walk to learn about other world religions. To encourage members to grow stronger in their faith, religious groups have developed the following religious emblems programs. The Boy Scouts of America has approved of these programs and allows the emblems to be worn on the official uniform. The various religious groups administer the programs. Check with your local council service center or contact the religious organization directly to obtain the curriculum booklets. Download the Duty to God program information. To serve as a chaplain or chaplain aide is a unique opportunity for ministry. While serving in these offices, you will have the opportunity to help Scouts as they grow, both physically and spiritually. Some techniques to be used are modeling, mentoring, and offering faith-based experiences. 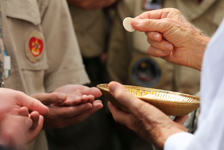 Use this handbook to help you become better oriented to the duties, responsibilities, and opportunities of chaplaincy service in Boy Scout troops and Venturing crews. It includes useful information and resources to help you better perform your duties.